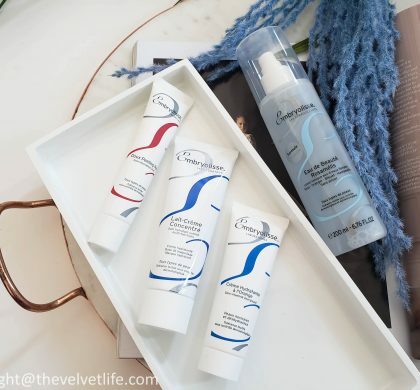 I reviewed Lumiere Essentielle Illuminating Oil Serum and Illuminating Oil Gel-Cream from Darphin a few months back here and emptied both of them last month. 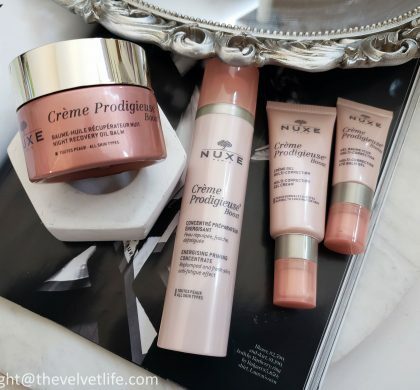 I am really impressed with both of the products and hence it is natural to be excited to try more from the brand. Winter had been really brutal this year and my combination skin has been a little on the drier side this year, so something moisturizing which does not breaks me out is my preference. 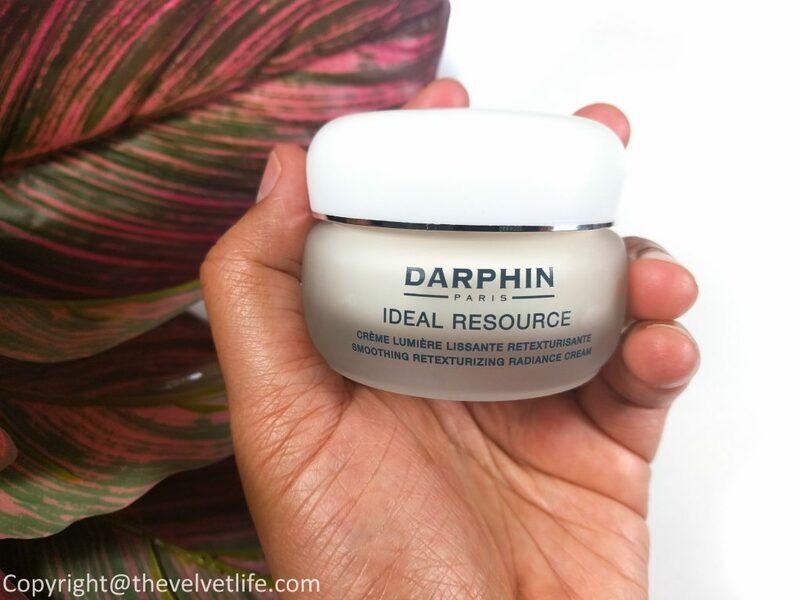 I have been using Darphin Ideal Resource Micro-Refining Smoothing Fluid and Darphin Ideal Resource Smoothing Retexturizing Radiance Cream since last month. Ideal Resource line from Darphin is for someone who has concerns about radiance and anti-aging. It is ideal for skin displaying first signs of wrinkles and loss of radiance. Ideal Resource helps visibly erasing wrinkles and imperfections while helping to revive skin’s radiance. 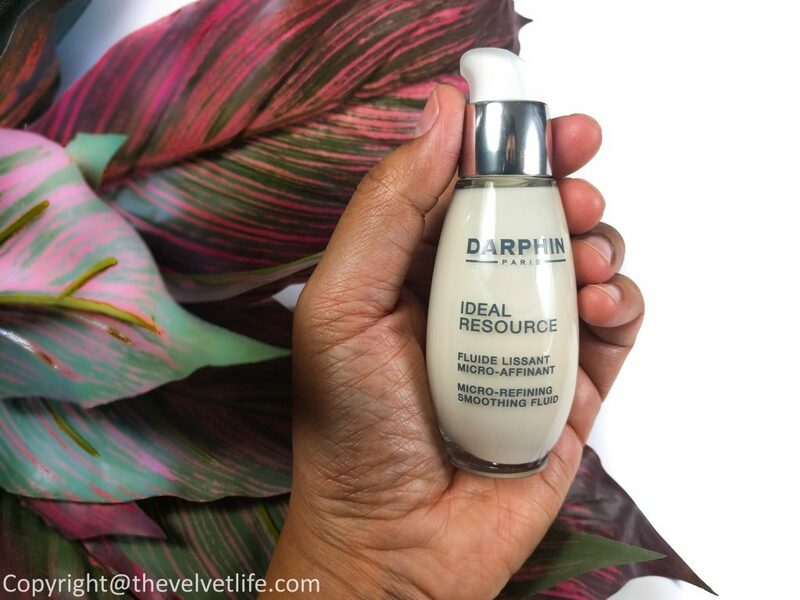 Darphin Ideal Resource Micro-Refining Smoothing Fluid is described to be specially created for the needs of combination skin. Ideal Resource Fluid contains micro-refining technology that smoothes the look of the fine lines and wrinkles and unifies the skin’s surface. The light fluid is delicately scented with white flowers. This fluid refreshes and clarifies skin, tightens pores and prevent new imperfections, illuminates and enhance skin radiance, moisturizes skin, and refines texture. The active ingredients include Line Polish Complex: Centella Asiatica, White hibiscus, and Knotwood, N-Acetyl- Glucosamine, Mattifying powder. The fluid is housed in a sturdy glass bottle with a pump dispenser. I use this fluid in the mornings, although it can be used in the evening also, after applying my serum. I take a pea-sized amount and massage gently in upward strokes. This fluid is very light and soaks right into the skin. I like the fragrance of it, makes it a ritual to inhale the smell and apply. I do use this on the days I am using my serum along with face oils. My skin stays hydrated and does not look shiny or oily or with any residue. It stays on well under the makeup also. It does not emphasize my problem areas or dry areas but I have noticed fewer breakouts in general. It does not cause any irritation. Overall, the skin looks healthy, smooth, and radiant. Darphin Ideal Resource Smoothing Retexturizing Radiance Cream is described as a deliciously rich cream with a unique trio of flowers acting in synergy to help rebuild the vital resources of younger-looking skin. 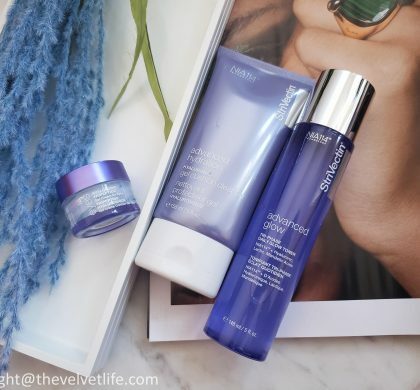 The combined properties have the power to improve skin texture, revive complexion luminosity, and smooths away any lines and wrinkles. The active ingredients of the cream are Line Polish Complex: Centella Asiatica, White hibiscus, and Knotwood. I apply a small amount of this cream after my serum and oil during the evening. It can be used in the morning, perfect for the winter when my skin is feeling overly dry and needs some extra moisture before makeup, otherwise, I do prefer the rich texture in the evenings. The cream is housed in a sturdy glass jar, like other Darphin moisturizers and creams. The cream is very gentle and does not irritate my combination acne prone skin. The cream does not leave any residue and is not greasy. If used in the morning, the makeup sits on pretty well over it, no issues with that. I like the smell of this cream, very delicate and soothing. The skin looks smooth, evened out, and radiant after few uses, I have used it for over a month and do see a good difference in how my skin feels and looks. 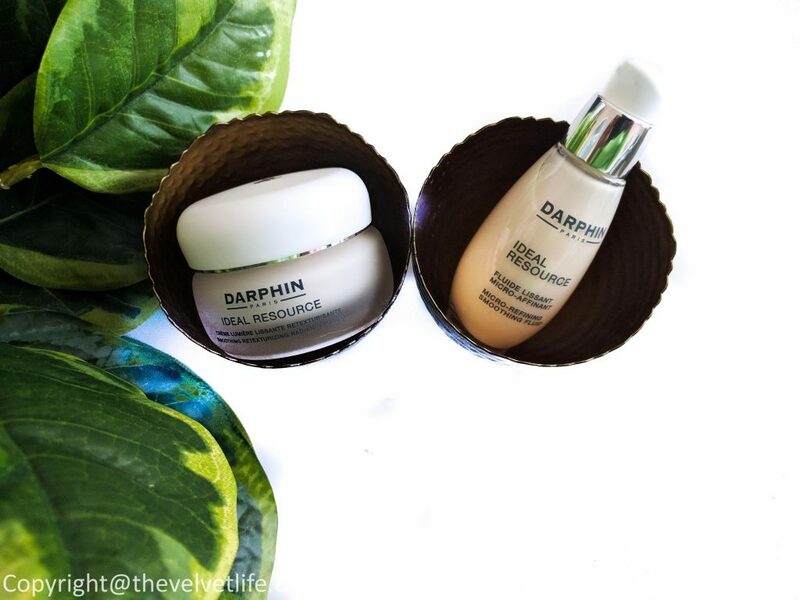 Darphin Ideal Resource Micro-Refining Smoothing Fluid and Darphin Ideal Resource Smoothing Retexturizing Radiance Cream are available to be purchased at Sephora Canada, Beautyboutique by Shoppers Drug Mart, and Holt Renfrew.